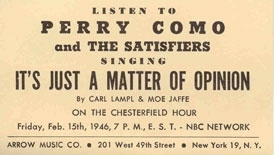 Collegiate, The Gypsy In My Soul, If I Had My Life To Live Over, If You Are But A Dream, Bell Bottom Trousers and I'm My Own Grandpaw are the stars of Moe Jaffe's catalog -- the "big six" standards that earned their place in the American Songbook. Beyond those six are over 250 titles written over the better part of four decades, reflecting the tastes and styles of each passing era. Some are novelty numbers: Oh, You Sweet One, written with Paul Kapp in 1949, recorded by The Andrews Sisters; Bread And Gravy, written with Dwight Latham in 1948, recorded by Homer and Jethro; and I Like Bananas Because They Have No Bones, written with Lanny Grey and Peter Lind Hayes, recorded by the Hoosier Hot Shots. The Big Band era saw: I Don't Know From Nothin', written with Henry Tobias in 1949, recorded by Don Cornell and Laura Leslie with the Sammy Kaye Orchestra; It's Just A Matter Of Opinion, written with Carl Lampl in 1946, recorded by Gene Krupa; An Apple A Day, written with Clay Boland in 1936, recorded by Hal Kemp; and Charlie Was A Boxer, written with George Keefer and Vincent Lopez in 1940, recorded by Lopez. 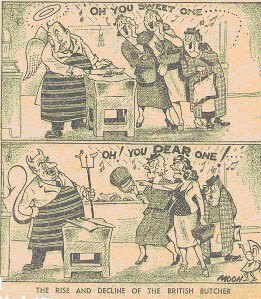 There are topical pieces: Thumbs Up, the Official Theme Song of the British War Relief Society, written in 1941 with Jack O'Brien and Bert Lown; and Ingemar, written with Olle Bergman in 1959 in honor of heavyweight champion, Ingemar Johansson, recorded in Swedish, Norwegian, Danish, Flemish and Icelandic. A few Jaffe songs have a spiritual or gospel flavor: Get Together With The Lord, written with Bickley Reichner in 1945, recorded by Andy Kirk's Orchestra with The Jubalaires; Pray, written with Reichner and Clay Boland in 1950, recorded by Hank Snow;Just Whisper, written with Reichner in 1951, recorded by Savannah Churchill; and These Things Are Known (Only To God), written with Paul Kapp in 1951, recorded by Jan Peerce. In the 1960s, each of these genres had seen better days and Moe joined the ranks of writers who, for one reason or another, just didn't get the changes in the music. Fortunately, General Music Publishing enjoyed a few more prosperous years by publishing a song called I Left My Heart In San Francisco, written by Douglass Cross and George Cory. By the time of Tony Bennett's hit, Moe was suffering from Parkinson's Disease and his overall health was failing. He passed away on December 2, 1972, and is remembered fondly by all those who enjoyed his humor, appreciated his gentle ways and sang his songs.